Jackfruit is a common ingredient in Sri Lanka, a country known for outstanding veggie cooking. Perfect for curries, we add ‘meaty’ chunks of the fruit to a coconut broth spiked with aromatics and a signature spice blend. 1. Boil a kettle. Rinse the black rice and place in a saucepan with 400ml boiling water and a pinch of sea salt. Simmer for 25-30 mins, then drain. 2. Dice the onion and cut the red pepper into bite-sized pieces. Finely chop the garlic and peel and grate the ginger. Roughly chop the coriander leaves and stalks, keeping separate. 3. Drain and rinse the jackfruit. Dissolve the creamed coconut in a jug with 250ml boiling water. 4. Heat a medium-sized pan with 1/2 tbsp oil on a medium heat and cook the onion for 5 mins, then add the Sri Lankan spice mix, garlic, ginger and coriander stalks and cook for 1 minute. 5. Then add the red pepper, jackfruit, tamarind paste, creamed coconut, coriander leaves and half of the desiccated coconut to the pan. Mash the jackfruit roughly with the back of a spoon. Season with sea salt and black pepper. Place a lid on the pan and simmer for 10 mins. Then remove the lid and simmer for a further 5 mins to reduce the sauce, add more water if needed. 6. Finely slice the green chilli (remove the seeds for less heat). 7. 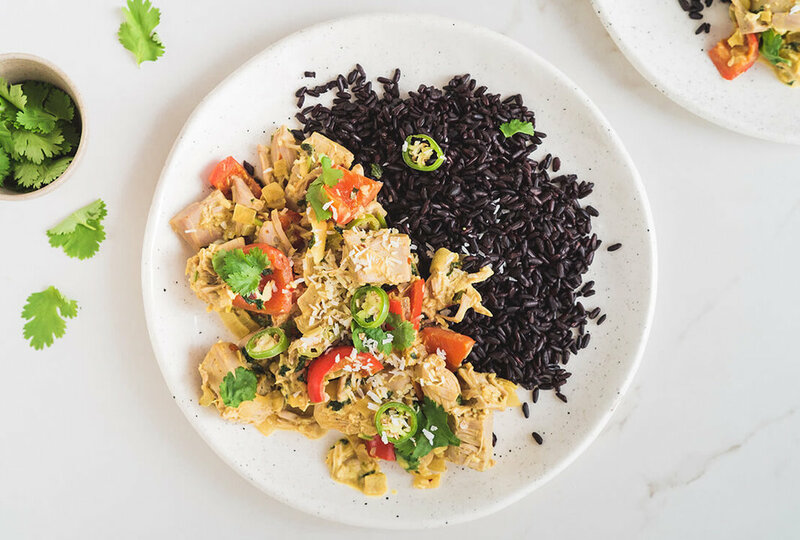 Serve the Sri Lankan jackfruit curry on two warm plates alongside the black rice and sprinkle over the green chilli slices and the remaining desiccated coconut.